Portuguese people do not choose public transports as their main means of transportation. The data published this Wednesday by Eurostat on Industry, innovation and infrastructure showed the picture is wary for the Portuguese public transport system, as the only country accomplishing worst results than us was Lithuania. On top of the ranking, there is Hungary (31%), Czech Republic(26%) and Slovakia (25.2%). If we look at trains usage in detail, Portugal was significantly below EU’s average (7.7%), scoring 4.4%. 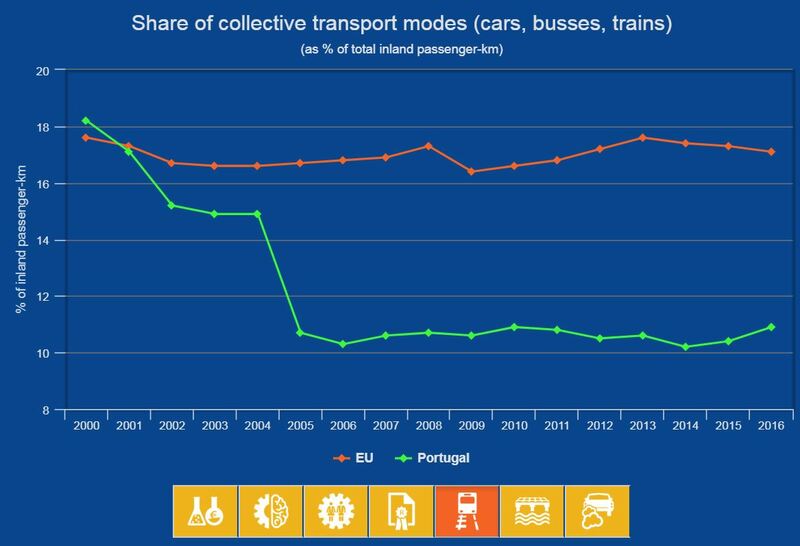 Since 2000 the EU has recorded a trend to use more this type of means of transportation (from 7.2% in 2000 to 7.7% in 2016), a trend which hasn’t been accompanied by the Portuguese (decrease from 4.6% to 4.2% in the same period). In regards to buses Portugal is also sailing on different tides than the EU: the EU28 average stands at 9.4%, while the Portuguese buses get 6.7%. Hungary(21.7%), Cyprus (18.6%) and Malta(17.4%) lead this rank, in comparison, although importantly Malta’s only means of public transport is the bus. In 2016, only 10.9% of the total km travelled in the country were made by resorting to public transports, in comparison to EU’s average of 17.1%. After Portugal, only Lithuania scored less (10.1%).